Figure 1. Fusarium stalk rot can often be recognized by the presence of cottony white/pink/peach colored fungal growth around the nodes of plants (A) and/or by the presence of pink/red discoloration inside the stalk (B). Figure 2. 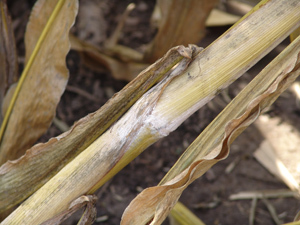 Shiny, black lesions visible on the outside of the stalks are characteristic of anthracnose stalk rot. Wet conditions and damage to corn caused by recent severe weather could increase disease both before and after harvest. Corn that was blown over or wounded by high wind or hail is more likely to develop late season diseases. 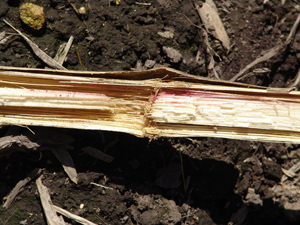 Loss of leaf area due to either foliar diseases, injury or herbivory may compromise stalk quality in maturing plants as they struggle to fill grain and resort to the stalk to provide what it needs. These weakened stalks are more likely to become infected by stalk rot fungi surviving in past years' crop residue. Prostrate corn will likely be exposed to longer periods of high moisture or humidity and require more time to dry. And, contact with soil and crop residue will expose the ears and stalks to more pathogens than normal. As a result, there may be more ear and stalk rot diseases in damaged corn. This week, stalks with Fusarium stalk rots andanthracnose (Figures 1 and 2) were submitted to the UNL Plant and Pest Diagnostic Clinic. Corn harvested from these damaged fields may have reduced quality and is at higher risk for the presence of mycotoxins produced by some common fungal pathogens. For more information about the ear rot diseases that lead to grain molds and mycotoxins, see the NebGuide, Grain Molds and Mycotoxins in Corn (G1408).